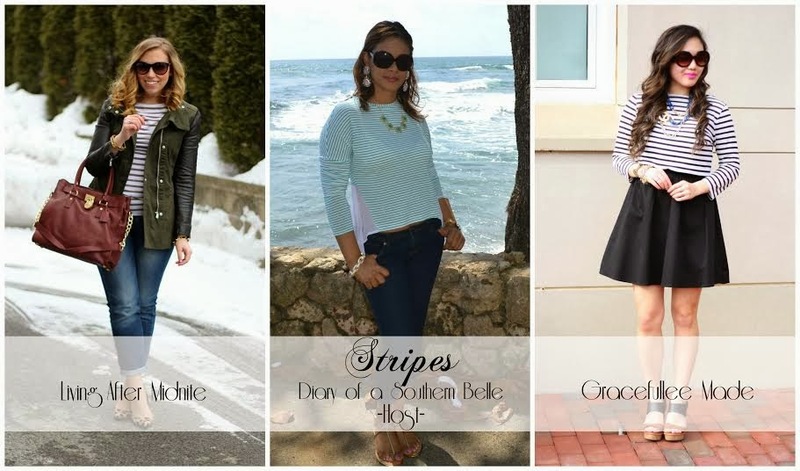 Today, I'm teaming up with Candy of Diary of a Southern Belle and Jackie of Living After Midnite to show you 3 ways to wear stripes... and each item is under $30. Head on over to these blogs for more deets on their looks! As for the giveaway, you can win a $30 TJ Maxx gift card, 'Love Me' necklace, Steve Madden Electric Fedora, and a Coach signature roll-on perfume! P.S. did you win my Benevolent Jewels Giveaway?? I opted for my flare LBD dress that I wore as a skirt to wear with my striped top. P.S. I decided to get a little creative with my accessories and attached my vintage Chanel brooch to my necklace that Coralie & Company sent over. I decided to get a little creative and wore my monogram necklace as a bracelet by simply attaching it to my gold chain link bracelet.